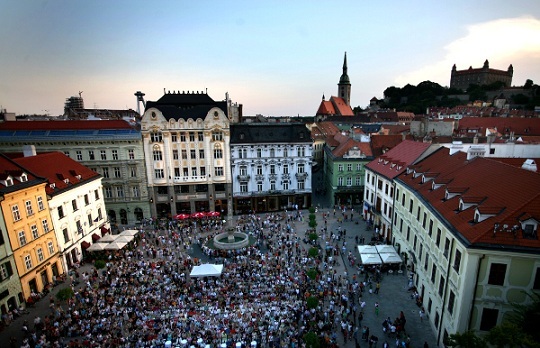 ESN STUBA is fifth section in Bratislava. We have about 50 incomming students and abut 190 outgoing students. This number is rising every year. For incomming students we provide Buddy system, social, cultural and sport activities. For outgoing students we provide informational meetings to inform them about possibilities to study abroad. Every faculty have it´s own representative to provide best services for incomming students, because every faculty have different location and different standards. The history of the higher technical education in Slovakia has started in the year 1762 by the foundation of the Academy of Mining and Forestry in Banská Štiavnica. The establishment of the Academy of Mining and Forestry was important moment in the history of higher technical education, as it was the first educational institution in Slovakia providing technical education at the university level. The Academy of Mining and Forestry has maintained its high level of standard for more than 150 years of its existence and has founded the tradition of excellence of higher technical education in Slovakia. Bratislava with its old-town charm, sophisticated restaurants, traditional pubs, good music ranging from jazz to opera, stylish people, has a Europe's greatest river as a backdrop. In case you want to get more info about the history of the city you should know that Bratislava used to be known as Pressburg to German speakers or Pozsony to Hungarian speakers and it got its present name only 90 years ago. However, the city has a long and proud history that dates back to pre-Roman times. Even the local nature offers hillsides on the edge of the city, whichhave beenhome to vineyards for centuries. An impressive range of architecture, languages and cuisine offers many free time activities. One of the most valued landmarks is the Bratislava Castle with its long and chequered history (it had been destroyed more than once). It survived a major restoration and now offers great views over the medieval old town and the Danube valley from its fortifications.Communism, too,left its mark: across the river the unmistakable ranks of concrete housing blocks - paneláky in Slovak - line the horizon, with the unique UFO-style New Bridge in the foreground. And if, after all this, you still want some big-city 'glamour' feel free to exploit cheap travel options to Vienna, Budapest or Prague, which are close enough for a daytrip. Weekend trips to Budapest, Prague, Vienna etc.